Just imagine the reaction of Fintan O'Toole and Vincent Browne if Fianna Fáil ever tried a stunt like deem and pass? Just imagine the tut-tutting of Pat Kenny and George Hook. Just imagine. I hadn't been paying much attention to America's health care debate and I still don't have a firm grasp what exactly it is Congress may pass, but using this "deem and pass" method is outrageous. First, what is "deem and pass"? ... the health-care bill would be voted on INDIRECTLY, tucked into what's known as "the rule." The rule essentially outlines the rules for an upcoming vote -- in this case, it would be the vote on the package of reconciliation fixes. By passing "the rule," the House also would "deem" the Senate bill passed (with a "hereby" statement. "We hereby deem..."). The House would then vote on the package of reconciliation fixes. But the Senate health-care bill would be considered passed even if they never vote on the reconciliation fixes. Get that? No, well basically it's a trick where the health care package is passed, but nobody has to be tarred as having voted for it. I like how David Brooks sums up what this means. ... This is the largest piece of legislation in a generation and Pelosi wants to pass it without a vote. It’s unbelievable that people even talk about this with a straight face. And he voted for Obama. This will be Barak Obama's legacy. 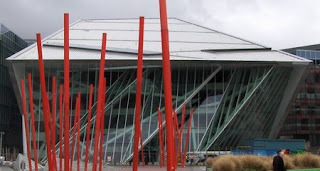 Dublin's new Grand Canal Theatre opened last night. I presume it's as spectacular inside as outside (eh, no, I don't know what's going on with those red things). It sure will be a pricey experience to go to the new theater. My wife and daughters were looking at tickets for Hairspray later this year. The cost of the tickets - including booking charge - was a lot more than they paid last summer for flight to London, train journey into the city and tickets to the show there. President Obama thanked Brian Cowen for allowing American troops use Shannon as a transit stop on the way to Iraq and Afghanistan. That's the insurance policy against being tagged as a tax haven. Avoiding tax haven designation is one of the keys to economic recovery. Remember last November when just about all teachers and civil servants and others went on strike for a day? That was before the budget when all the pay cuts were implemented. Remember? Well, I know of one state body that has only now gotten around to deducting the pay for that day - at the 2010 salary scale. That means the strike day was 5% (if that was the pay cut) less expensive to each of that body's employees than they had a right to expect AND 5% more expensive for the state than it should have been. I'd love to know if this is the case throughout the public sector. Still working on comments. Sorry about the big delay. I'm regularly posting on Twitter. My goal is to get this blog to be more like a series of short twitter posts, but with comments. Haloscan pulled the rug out from under me and I haven't had enough time to get Disqus comments working. I also probably need a new blog template, but haven't found one I like yet.